CI Ph.D. Students demonstrating aspects of particle accelerator science at the 2014 Big Bang fair. As a world-renowned international centre of excellence based at Sci-Tech Daresbury for particle accelerator research, design, construction and operation, the Cockcroft Institute (CI) receives numerous requests for work experience and summer student placements, tours, talks and lectures and invitation to participate in public events. Public engagement is part of the mission statement for both the CI and STFC, and that of each partner University within the CI. Public engagement and outreach is something which CI staff and students undertake gladly to demonstrate to the public and students at all levels why ‘big science’ is so important to the UK and society as a whole, and why appropriate funding and a constant stream of new scientists and engineers is essential to ensure the UK’s position at the forefront of scientific research. The CI collaborates with various other institutions such as the Institute of Physics, the Royal Society and the John Adams Institute to deliver high-calibre public events at venues all over the country. We exhibited at the prestigious 2009 Royal Society Summer Science Exhibition, and we regularly appear at the national and regional Big Bang fairs. 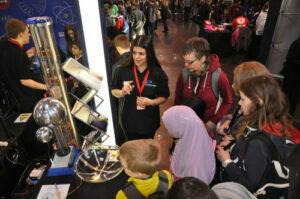 The CI outreach team works in close collaboration with STFC’s Public Engagement team at the Daresbury Laboratory to deliver a number of regular public events, most notably the annual Particle and Accelerator Physics Masterclass and regular Laboratory ‘Access Days’. We also support visits from school groups, colleges, universities and learned societies (such as the Institute of Physics or Institute of Engineering Technology), industry and industrial partners, and occasionally even VIPs! We are able to deliver presentations show-casing aspects of specific accelerator R&D and its relevance to the field, and also overviews of various particle accelerators, catering the delivery and complexity level to the audience. This is often done at the Laboratory, but can also be done on request at a school, college or university. Both the CI partner universities and STFC have their own student placement programmes for work experience and paid summer students. We also participate in the Ogden Trust summer intern programme, offering several projects each year. Requests for work experience at the CI should be directed to the Outreach team. If you invented a giant machine – what would it do?